Vietnam's Communist Party General Secretary Nguyen Phu Trong is sworn in as the country's president in Hanoi, Vietnam (Oct. 23, 2018). A dual-hatted Nguyen Phu Trong provides renewed strength to the Vietnamese state. After President Ho Chi Minh passed away in 1969, his successors in the Politburo of the Communist Party of Vietnam (CPV) seemingly agreed that no one else would simultaneously assume the newly vacant positions of Party chief and state president. Under this agreement, national affairs have been decided for nearly half a century by the senior members holding the four top leadership posts – the CPV general secretary, the state president, the prime minister, and the chair of the National Assembly – constituting the “four pillars” in Vietnamese. The Party chief, however, had the most important voice. But that changed after President Tran Dai Quang passed away in late September. On October 2, 2018, the 8th Plenum of the CPV Central Committee unanimously nominated General Secretary Nguyen Phu Trong for president. In a one-party regime where CPV members hold over 90 percent of the National Assembly seats, Trong’s official election as president – which took place on October 23 – was merely a formality. In tapping Trong to hold the two positions simultaneously, Vietnam’s Communist Party leadership has been indirectly influenced by the Chinese Communist Party General Secretary and President Xi Jinping’s centralization of power in China. With Trong now holding two key positions in the leadership, what consequences and outcomes might result for Vietnam? Toward the end of the Cold War, with the exception of Vietnam, Laos, and China, other communist countries combined the office of the Communist Party general secretary with the presidency (head of state). After many communist systems disintegrated in the late 1980s, Laos and China also merged these two positions in 1991 and 1993, respectively, in the pursuit of greater international integration, especially in the context of economic globalization. Thus China was just one of many countries to have combined the head of state and head of Party roles. Vietnam was an exception in this regard. Clearly, Vietnam was not totally following the Chinese political blueprint. However, when comparing the socioeconomic and political changes that have occurred in both countries since the Vietnam War, it is undeniable that Vietnam has followed the Chinese model, with a lag of a few years, in other key policy areas. Vietnam first followed China’s lead on economic policy in the 1980s. In December 1978, the Central Committee of the Chinese Communist Party (CCP) decided to abolish agricultural collectivization in favor of small-scale private farms. In January 1981, the CPV Secretariat similarly issued Directive 100 on contracting agricultural product to farmers as group and individual. In 1980, China established the first special economic zone in Shenzhen as a pilot for a key economic program, which many argue was one of the first steps toward expanding both the marketization of China’s economy and foreign investment. Six years later, in 1986, the 6th CPV Congress launched a Vietnamese economic reform program known as “Doi Moi” by transforming the centrally-planned economy into a multicomponent commodity economy operating under market mechanisms. Vietnamese leadership has also followed China’s lead on corruption issues. Since 2012, immediately after emerging as paramount leader, Xi has conducted the largest anti-corruption campaign in the history of contemporary China. The CCP Central Commission for Discipline Inspection has served as Beijing’s primary implementing tool. Likewise, right after his election as CPV general secretary for a second term in January 2016, Trong launched a general offensive on corruption with the Party Central Inspection Commission as his main enforcer. While considering the above-mentioned similarities between the two countries, which are also neighbors, it would not be surprising if the image of a strong and effective leader created by Xi Jinping has captivated a Vietnamese leadership determined to fight corruption to maintain the communist regime in Vietnam. Vietnamese leaders, after all, have long admired the power of Chinese leaders. Before the 12th CPV Congress of the Communist Party of Vietnam, or more precisely during Prime Minister Nguyen Tan Dung’s two terms from 2006 to 2016, the state was very weak. Due to his corrupt regime and immense power as holder of state resources, Dung not only ignored the three remaining “pillars” in making national governance decisions but also manipulated the institutions in his favor. Corruption under Dung made the Vietnamese state not only unable to protect its citizens against property seizure and harassment from authorities, but also left the country potentially impotent before China, which has continually threatened Vietnam’s territorial and economic sovereignty. In order to restore a strong state as well as the prestige of the Vietnamese Communist Party, General Secretary Nguyen Phu Trong, President Truong Tan Sang, and National Assembly Chairman Nguyen Sinh Hung formed an anti-Dung coalition with Trong as its nucleus. As a result, Dung was ousted from the new Central Committee elected at the 12th Party Congress. In the context of a fierce anti-corruption campaign, General Secretary Trong ascending to the presidency, while also chair of the CPV Central Committee for Preventing and Fighting Corruption, is a logical political development. Trong’s supporters will argue that his new state position will help him and the party implement their policies without any obstacles. More importantly, it will allow the public to hold the party accountable by no longer allowing them to claim its policies are correct, but that the state has wrongfully implemented them. Strong state leadership as a product of Nguyen Phu Trong’s dual roles will also give Vietnam a much better position in protecting its national interests before China. Longstanding Chinese efforts to influence Vietnamese leaders may have started to succeed during Dung’s regime because of corruption at the top. During Dung’s time in office, Chinese enterprises gained control over some strategic sectors and many strategic locations in the central highlands and coastal areas in Vietnam. However, since the 12th CPV Congress in January 2016, when Trong successfully blocked Dung from the new Central Committee, no new Chinese firms have been allowed to enter Vietnam to establish investment facilities. 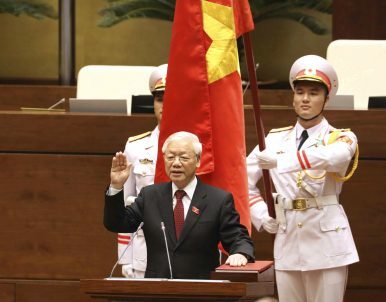 While Trong is conservative in his wish to maintain a one-party regime, his reputation as a leader of integrity and devoted nationalist should allow him to pursue Vietnam’s national interests from a position of stability. As for the United States, the Trump administration should certainly welcome a strong Vietnamese state despite deep disagreements with the Vietnamese government on democracy and human rights issues. Indeed, Vietnam with a weak state would — without fail — fall prey to expansionist and hegemonist China, which would severely, even irreparably, damage the interests of the United States. Dr. Cù Huy Ha Vu holds a Ph.D. in Law. He is a Vietnamese dissident and a former political prisoner.